Having read fellow foot soldier, Lewis Connolly’s recent blog about being in the Tartan Army on Twitter and re-Tweeting it to my followers, I was asked if I would share my experience on being a Scotland fan. I went to my first game when I was eight, the World Cup Italia ’90 warm up game at Hampden against Poland. I was ‘treated’ to a 1-1 draw which saw a spectacular own goal by Gary Gillespie even the match on a sunny May day. Those were the days, qualifying for tournaments regularly! If only I knew then what I know now! 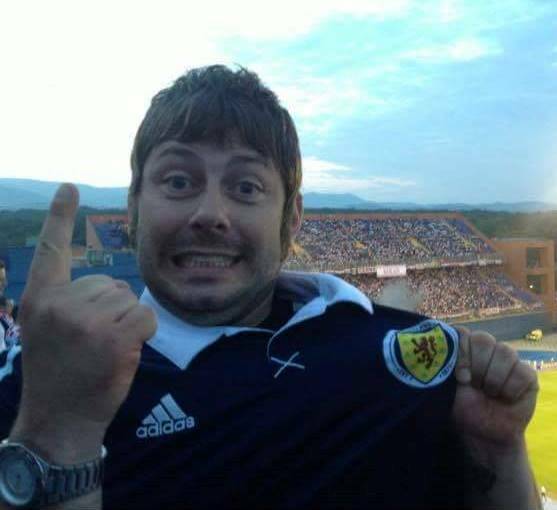 I was introduced to a foot soldier who had started going out with a friend of mine from school and he offered me a ticket to watch World Champions Spain at Hampden in a 2012 European Championship Qualifier. True to form Scotland put up a heroic fight only to be defeated at the death – a typical Scottish failure if you like. However, that didn’t put me off going again, I was hooked! The camaraderie during the day in the pubs, the rousing rendition of the national anthem pre-match, the finger nail biting atmosphere at the game – they simply all struck a chord with me. I didn’t want it to end. It only took 23 years to see my first Scotland victory, a 1-0 home win against Estonia at Pittodrie in February 2013. The stories I can tell folk back at home of the escapades the Tartan Army get up to on their travels are lengthy; some for the ears of all, others perhaps not! The pubs, bars, city squares et al in which we spend our hard earned, making new friends, singing songs, swapping shirts, embracing new cultures – that’s what make Scotland away days so great! 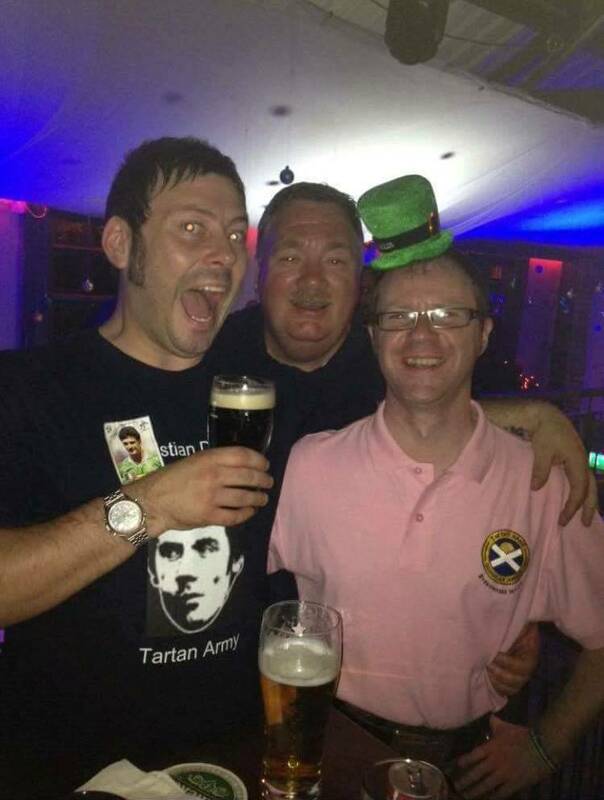 Aside from the alcohol fueled shenanigans now deep in TA folklore, it would be remiss of me to not mention the plenty of good folk who are involved with the Tartan Army Sunshine Appeal. When I first heard what this fantastic charity stood for, I was dumbfounded. It’s simply amazing to think that at more than fifty consecutive away games, a charitable donation has been made to worthwhile recipients across Europe and beyond. The hard work behind the scenes is a wonder to behold, as is the superb nature of the Scottish supporters who continue to fund this opportunity to make children’s lives across the lands that little bit better. There are countless memories etched in my mind of away days but I can honestly say the following is definitely up there as being one of the most memorable. Like Lewis said, the Tartan Army is defined by the openness, generosity and willingness to help others, and that is what the Sunshine Appeal does best. I’ve only been to one donation per se so far – in Dublin last summer, prior to the 2016 European Championship Qualifier against the Republic of Ireland. I was also present in the stands in Molde, Norway when TASA’s 50th donation took place on the pitch at half time during a 1-0 win. Back to Dublin, where a donation to the ‘Aoibheann’s Pink Tie’ charity took place. This is an organisation that helps to offer practical help to children fighting cancer, as well as the families of those said children. This experience was one I can honestly say I’ll never forget. It was pretty tough to hold back the tears that night, as the APT recipient accepted a cheque to the value of €7000. His emotional speech detailing the story of his young daughter who sadly succumbed to cancer had many a hardened TA reveler in tears. He was overjoyed and thoroughly touched beyond belief at the donation from TASA. You could have heard a pin drop when the donation was made, such was the magnitude of the occasion. The venue was literally packed to the rafters of TA and Irish football supporters, mixing in unison, not only to enjoy the craic and occasion of the forthcoming game but more importantly, in my opinion, coming together as one to support a well deserving charity that does so much to help suffering youngsters. I was immensely proud to be Scottish that night, knowing that my peers had united in various ways to help create this wonderful occasion. I’m sure I’m not the only one who can say they walked away from that donation feeling a little bit lucky and fortunate, but also very humble having heard the story of the APT representative. It was touching to hear the APT representative had donated some gifts to Yorkhill Children’s Hospital in return too. ‘Everywhere We Go’, it’s the generosity and compassion of the Scottish supporters that allow the Sunshine Appeal to prosper and help those in need. Long may it continue. As for the game itself, it ended in a disappointing 1-1 draw, but to be honest, and I’m sure many a Scotland fan will agree, donations like the one in Dublin will stick longer in the memory than any football match.